And the Pawe d'Or goes to... "The Time of Love" by John Manfredi and Jenny Nesvetailova! Thanks to all supported the 2013 Feline Film Festival. View photos from the 2013 event! 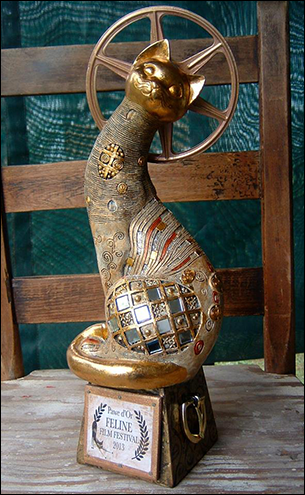 2013 Feline Film Festival Pawe d'Or award created by artist and filmmaker Milford Earl Thomas. View photos from the 2013 event! 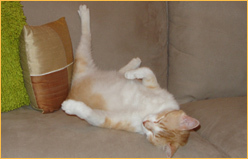 The first annual Feline Film Festival was held on October 19, 2013 in Atlanta, Ga. Through ticket sales and generous donations, the event raised $2,000 for LifeLine Animal Project. The following films were shown at the first annual Feline Film Festival in Atlanta, GA. The order they are listed in is the order they were presented in the program. A one-on-one with Grumpy Cat about Starbucks coffee cake, windows, and sleep. A thrilling hunt for stripus felinus, otherwise known as lazy housecat. Zinema host BOB Cat checks out a rappin' feline who is just "Doin' Cat Stuff." Faux trailer for a horror film. Kitteh breaths fire and destroys cars... well maybe after a snooze. A glimpse into what Wendell likes to do. Gary, a lonely cat, has a sad birthday when no one comes to his party. The next day he makes an online dating profile, hoping to find someone special. Will Gary find love? 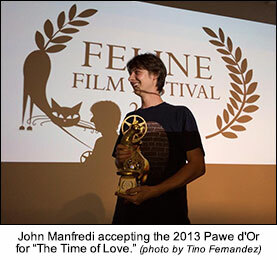 * "The Time of Love" is the 2013 Pawe d'Or winner for excellence in feline filmmaking! A young man finds the cure for his heartbreak. An animated PSA for the Humane Society. Learn about the famous Ernest Hemingway cats. Mrs. Chippy: part supercute loud purring kitten, part indestructible furry bouncy ball. Brushing your teeth becomes impossible when Tap Cat is around. Sophie and her kittens - in HD. Catlanta hides his unique cat art around town, posting photos online so people can find them. 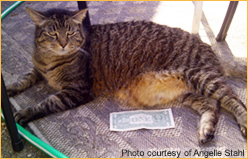 When you're away, the cat and dog will play... poker? 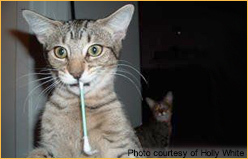 Cats love laser pointers. 'Nuff said. And spazzes out over the deliciousness. Panda obtains a bag of the good stuff. King Elliot ventures to lower Georgia to join in the Renaissance Festival merriment. Prepare for the Catocalypse! Watch what happens when cats commandeer tanks. Girl meets cat. Cat goes psycho. Girl and cat become friends! A film about reflection, "Balloon Cat" focuses on a cat floating helplessly through space, tethered to balloons, as his life flashes before his eyes. According to some ancient and woefully idiotic superstitions, black cats have a bit of a bad reputation. Our cat Jill couldn’t care less. In homage to the late great Scatman John. I'm Debbie, I love cats and I just want a soulmate! A tour of the newly renovated Cat TV Room. 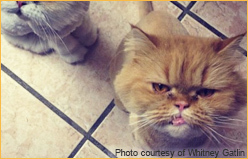 Learn the answer to the question: "Just what do they DO at a cat show?" Stylish headwear for cats, courtesy of MailChimp. 2013 Ticket sales benefit LifeLine Animal Project.